CE marked: Minimize your lab’s validation work. Enhanced workflow: No manual antibody cocktail preparation. Consensus aligned: Ensures you work according to international guidelines. Small kit size: Adapt your inventory to actual demand with the 25 tests/vial. Versatile: ClearLLab can be used with peripheral blood, bone marrow and lymph node specimens. 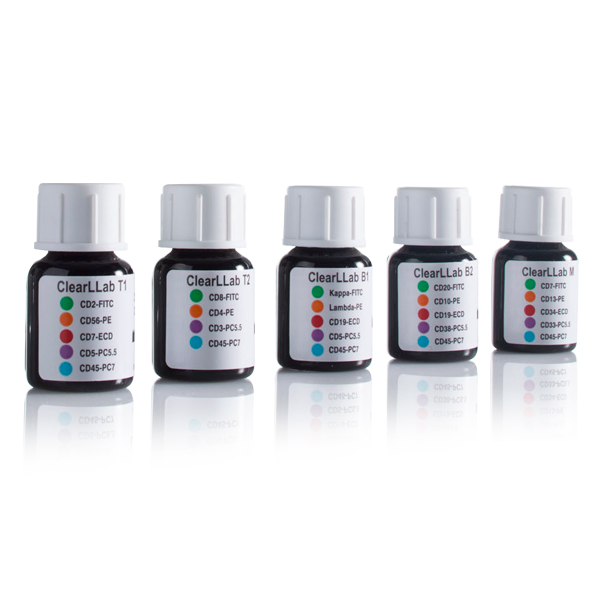 Identify major cell populations with ClearLLab’s 5-combination, 18-marker panels. ClearLLab M CD7-FITC/CD13-PE/CD34-ECD/CD33-PC5.5/CD45-PC7 The antigen specificity of the CD7, CD13, CD33, CD34 and CD45 monoclonal antibodies comprising the ClearLLab Myeloid reagent has been previously established by the Human Leukocyte Differentiation Antigen Workshops.